The bar, dining, and entertainment space called Eden is three levels and offers sea views and innovative design. BAHAMAS -- A waitress on the new Celebrity Edge cruise ship stood at my side in the Eden lounge and asked if I could explain the entertainment to her. I looked down from my vantage point and saw a man playing a didgeridoo while a woman dressed like a celestial goddess from a 1930s Busby Berkeley movie sang in an apocryphal language. A bald man was spinning on a steel crescent suspended from the ceiling while a group of “Mad Max”-esque dancers writhed in what appeared to be a dystopian mating ritual. The waitress smiled expectantly, waiting for an answer. Whatever it was — I’m certain both of my guesses were completely off the mark — I liked it because it was so weirdly different from anything I had ever seen on a cruise. Why was there a sitar? Who was the woman running around and falling on a pillow? This was not your standard issue cringe-inducing cruise ship entertainment, and for that I was grateful. There was a lot about the new Celebrity Edge that was reinvented. The Edge, which began preview sailings late last month, is the line’s attempt to upend the industry and target an audience that has been reticent to cruise. The Celebrity Edge launched with an inaugural sailing from Fort Lauderdale to the Bahamas in late November. The Edge, Celebrity’s first new ship in six years, offers rooms with floor-to-ceiling windows, serene color schemes, and fast Internet. The balconies are incorporated into the main cabin area, creating rooms that are about 23 percent larger than traditional balcony cabins. It’s not unlike the feature found on ships for river cruising. It also made for some incredible views. 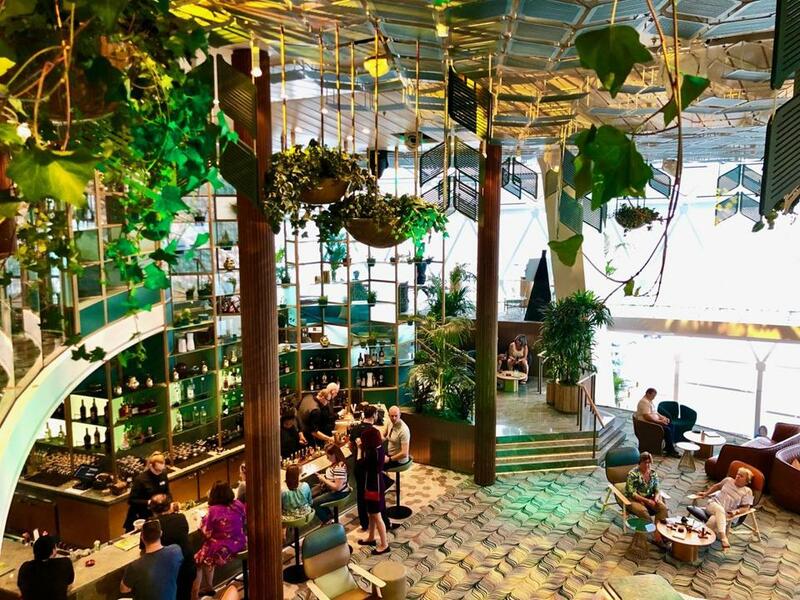 There’s more greenery at the back of the ship in the three-deck-high, plant-filled lounge, dining, and entertainment venue called Eden. With its soaring windows, it looks like nothing else on the ocean. 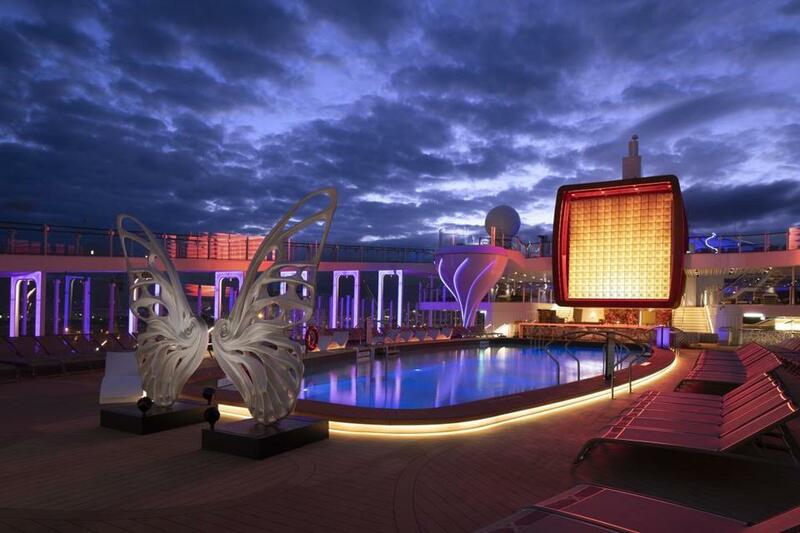 The ship’s most distinctive feature is a 90-ton platform called the Magic Carpet. It acts as a tender-boarding platform when it’s lowered to deck two. The rest of the time the tennis court-sized platform is raised to become part of a seafood restaurant on deck five or a lounge on deck 16. 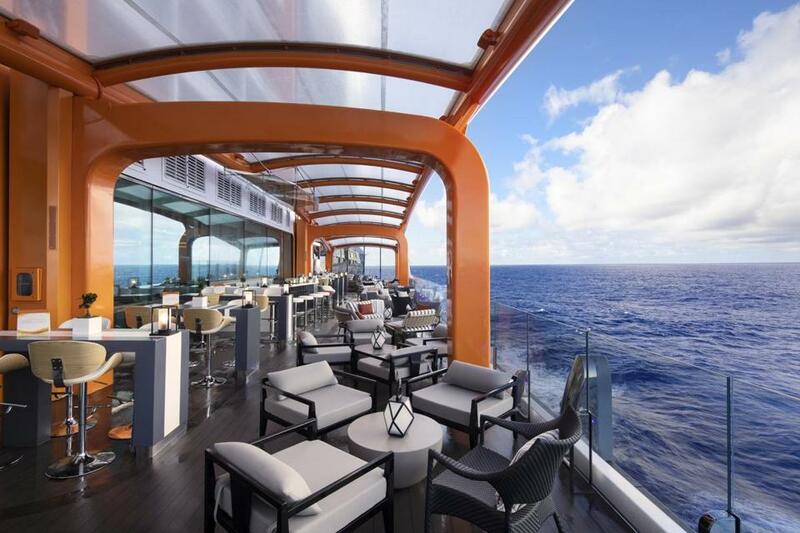 Contrary to the name, guests cannot ride it up and down while it’s in motion, but sip enough champagne on the cantilevered tangerine-colored platform at sunset and you’ll feel like you’re flying over the sea. The highlight of Celebrity Edge’s outward-facing vision, Magic Carpet is the world’s first cantilevered, floating platform that reaches heights of 13 stories above sea level. The man behind much of the unique architecture of the ship, British architect Tom Wright, said he wasn’t specifically thinking about millennials when he worked on the Edge. To appeal to that younger, coveted crowd, there is an emphasis on technology. I downloaded an app to my phone and could control all the features of my room. When I woke up in the morning, I rolled over, grabbed my phone, and opened the blinds. At night I could turn on the TV or turn off the lights. The Internet speed was among the fastest I’ve ever experienced on a ship. The Pool Deck features an outward-facing terraced deck. The technology extends to the restaurants. Dinner at Le Grand Bistro features 3-D animated mini chefs at each table. It’s gimmicky as all get out, but it’s a cute distraction if you’re not in the mood for deep dinner conversation. Despite Celebrity’s focus to bring young passengers aboard, the Edge doesn’t feel like a ship pandering to those in their 20s or 30s. There is a massive gym, a two-level sloping outdoor running track, and new kinds of shipboard entertainment. But these are amenities that can be appreciated by almost anyone. While I enjoyed the features of the ship, the restaurants, and the huge pool area, what was most memorable was the way I could experience sunsets. Yes, I’m one of those hackneyed old fools who goes out of his way to watch the sunset. I watched from the big garden on the top deck. I watched from the Magic Carpet, and when I just needed a minute to myself, I watched through the massive window in the wonderful solitude of my room.